As a singer and keyboardist, "Sweet Micky" is known for his compas music (konpa), a style of Haitian dance music sung predominantly in the Haitian Creole language, but he blended this with other styles. Martelly popularized a "new generation" of compas with smaller bands relying on synthesizers and electronic instruments. From 1989 to 2008 Martelly recorded over a dozen studio albums and a number of live CDs. As a musician and club owner in Haiti in the late 1980s and early 1990s, Martelly became associated with the Duvalierist Haitian military and police, including figures such as police chief Michel François, and he agreed with the 1991 Haitian coup d'état against Jean-Bertrand Aristide. In 1995, after Aristide had been restored to office, Martelly's name appeared on a hit list of Duvalier supporters, and he stayed away from Haiti for almost a year. During this time he released a song, "Prezidan" (on the album Pa Manyen), "an exuberant ditty that called for a president who played compas". However, he did not run for political office until 2010, when he became a candidate for President of Haiti. Martelly won the Haitian general election, 2010–2011 for his party Repons Peyizan (Farmers' Response Party), after a run-off against candidate Mirlande Manigat. Martelly had come in third in the first round of the election, until the Organization of American States forced Jude Célestin to withdraw due to alleged fraud. Martelly assumed his position of the President of Haiti on May 14, 2011. His election campaign included a promise to reinstate the nation's military, which had been abolished in the 1990s by Aristide. Martelly was born in Port-au-Prince, the middle-class son of a Shell Oil executive. On his mother's side, his grandfather Auguste de Pradine was a troubadour who wrote comic protest songs against the 1915-34 United States occupation of Haiti. After graduating from high school at the Institution of Saint Louis de Gonzague, Martelly enlisted in the Haitian Military Academy, but (according to Martelly) was expelled after impregnating the god-daughter of a general. In 1984, he moved to the United States, and worked in construction and briefly attended community college in Miami. In 1986, after one semester, he returned to Haiti just as Jean-Claude Duvalier, then president-for-life, was heading into exile. In 1987, Martelly returned to Miami with his then-girlfriend, Sophia Saint-Rémy, whom he later married in a small ceremony in Miami, Florida. They returned to Haiti in 1988. Upon his return to Haiti, Martelly had his first breakthrough in the music industry when he began playing keyboard as a fill-in musician in local venues in Pétionville and Kenscoff, upscale suburbs of Port-au-Prince. Martelly "sang playful, romantic numbers over a slowed-down merengue beat called compas, the only music allowed under the Duvaliers." After the 1991 Haitian coup d'état saw the expulsion of Jean-Bertrand Aristide, "Martelly opened a Petionville club called the Garage, where he entertained many of the coup's main architects, including the much-feared chief of national police, Michel François, later convicted in absentia for massacring Aristide supporters. 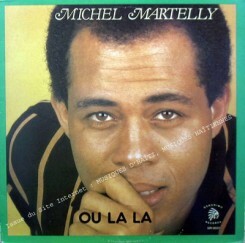 François liked Martelly's music so much that he allegedly lent the singer his own nickname: 'Sweet Micky.'" Martelly has been heralded as a pioneer of a unique brand of compas music, a style of Haitian dance music sung predominantly in the Haitian Creole language. Originally, compas, or konpa, was the creation of Nemours Jean-Baptiste. Martelly, a keyboardist and the self-proclaimed "President of Compas," popularized a nouvelle génération, or "new generation" style, of smaller bands with few members that relied predominantly on synthesizers and electronic instruments to reproduce a fuller sound. Martelly's live performances and recordings are sometimes laced with physical humor and humorous sociopolitical commentaries and satires. Although he is the most recognized musician and public personality in Haiti, Martelly's performance style has sometimes ignited controversy throughout Haitian communities. By 1988, Martelly's musical talent, charismatic persona, and his pattering style of compas had gained tremendous popularity at El Rancho Hotel and Casino and The Florville, another local venue. That year, he recorded his first single, Ooo La La, which became an instant hit, followed by "Konpas Foret des Pins" which was released in 1989, also a number hit from his debut album "Woule Woule". During the period of about 1988-2008 Martelly, using his stage name Sweet Micky, recorded fourteen studio albums and a number of live CDs. His music features compas music, slow meringue, troubadour, meringue carnival, raboday, etc. In 1997, Martelly's crossover appeal to other musical genres was evident when hipop and compas music star, Wyclef Jean of The Fugees featured him on the title track for Jean's solo effort Wyclef Jean Presents The Carnival featuring the Refugee Allstars. As Jean proclaims on 'The Carnival,' "Surprise - it's Sweet Micky, y'all!" Also in 1997, Martelly released an album containing one of his most celebrated hits, Pa Manyen ("Don't Touch"). The song is an adaptation of "Angola", composed by the renowned artist/composer/record producer Ramiro Mendes (of the Mendes Brothers), first recorded by Cesária Évora, the legendary Cape Verdean singer. Pa Manyen went on to be featured in various compilation albums, including the popular Putumayo Presents: French Caribbean in 2003. The song was also covered by Venezuelan singer, Soledad Bravoas "Canta, Canta Corazon" and by Jose Luiz Cortes of Cuba. See also the Mendes Brothers' original version of the song, performed by Ramiro Mendes included in the group's 1997 album - Para Angola Com Um Xi Coracao. Martelly is also notorious for his cursing on stage as well as using homophobic slurs.